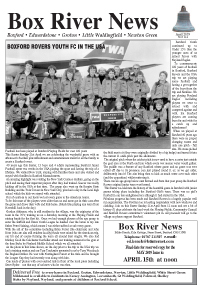 Boxford Playing Fields Committee News, Boxford Bike Club Charity Quiz Night, Simply Suffolk - A Tour of Suffolk Pub Signs by John Goodhand, Trip of a Lifetime, Prepare to Meet Thy Tomb, By The Way, Bill Horne 1944-2019, Community Achievement Award, Boxford Society Latest Developments, 24 hour Bike Ride for Suffolk Mind Charity, Boxford Rovers New Sponsor. 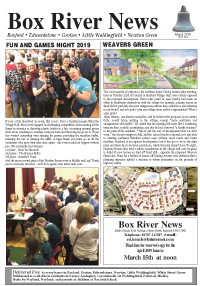 Weavers Green, Rocking in the Aisles, Discovering the Green Man - A Talk By Roger Green, A Home For The Press, How Counselling Can Help, Leaving Groton for Lancashire - 1836: The Rudland Family of Groton, SESAW, Festival of Golf at Stoke, Cheques for Wooden Spoon and Prostate Cancer. 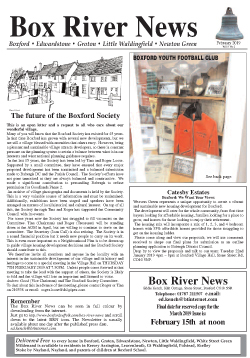 The Future of Boxford Society, Boxford Youth Football Club, Catesby Estates, Little Waldingfield's Festival of Carols in Flowers, Bonfires and Bells - a talk by Dr. Kate Jewell, Weavers Green - A Development Too Far, The American Tree, GP/Citizens Advice Outreach Scheme, Boxford Bounty, Sir Conrad Marshall John Fisher Swan KCVO FSA 1924 - 2019, Win a Balloon Flight for Two, The Names on our War Memorials, Football at Boxford. 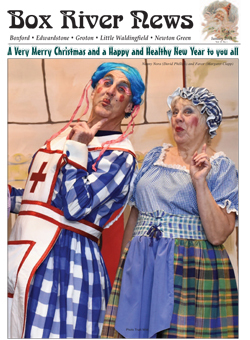 Grand Christmas Fair, Groton's Cheese and Wine Party, Christmas Greetings, thanks and blessings from Reepham, The Silk Trade of England - Richard Humphries, Boxford's New Little Wine Shop, Harry Buckledee, Laura Wins the K&S Cup, Awards for 3PRs Responders, Milden Singers, Winter Warmers, Boxford in the 18th Century, Cecil Hughes MBE, Boxford Drama Group's Sleeping Beauty.